"Great value and has enough bells and whistles to help encourage that late-night productivity." "A great choice for a writer or freelancer who doesn't have a need for drawer storage space." "It comes in black, espresso, or white, and can be mounted at any height." "Not only is this desk beautiful to look at, it's incredibly well made and extremely functional." "Reviewers say the desk is a gorgeous and extremely sturdy addition to their home." "A modern spin on the traditional corner desk." "A great choice for laptop lovers and mobile workers, offering a chic workspace when you want to buckle down." If you’re looking for a home office desk that will fit any space and look good doing it, the Loon Peak Newdale is the best overall choice. At just over $200, this desk is a great value and has enough bells and whistles to help encourage that late-night productivity. While the desk is made from engineered wood, reviewers say it feels sturdy and looks identical to the real deal. The desk is 53.15'' wide and 22.63'' deep, and comes with three drawers that all have safety stops—perfect for deterring curious little hands. Owners warn that you should carve out a few hours for assembly, but once it’s put together it feels firm and wobble-free. 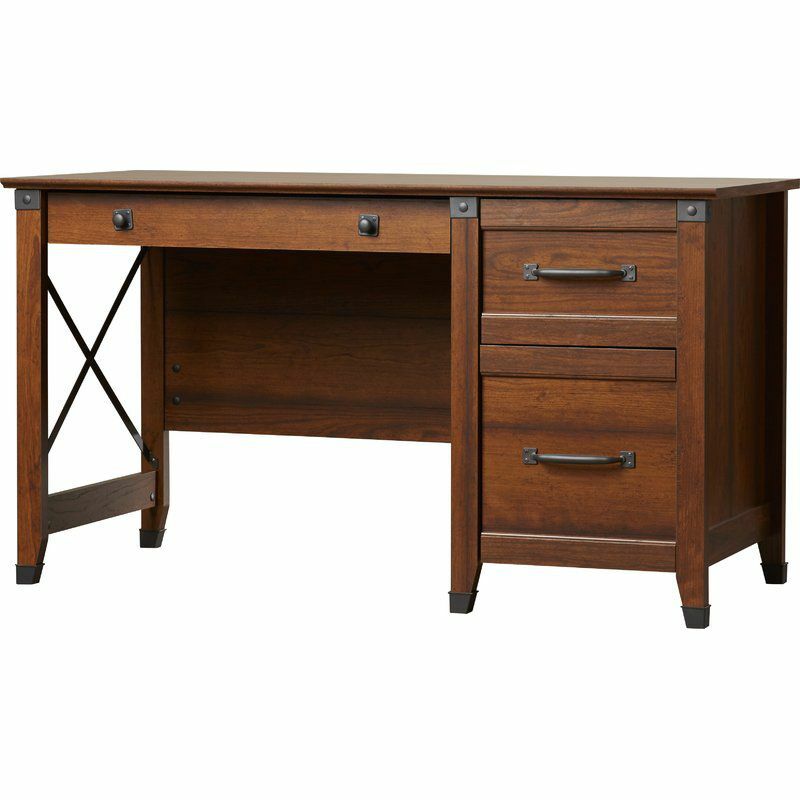 Overall, this desk is a great value for your money and has a beautiful timeless style that won’t look outdated in the years to come. The Tribesigns simple desk is a great alternative to the more traditional Loon Peak desk above. We picked this modern desk as our runner-up choice because it’s sleek, well made and a great value for your dollar. The desk comes in a variety of colors, with six different combinations of leg and desk stain choices. We love the teak and white leg combination for its modern feel, but all of the available options are elegant. This is a great choice for a writer or freelancer who doesn’t have a need for drawer storage space, and wants a seamless desk that won’t look bulky in a den or a living space. It’s 47.2" long and 23.6" wide and made from particleboard and stainless steel; owners say it feels incredibly sturdy and doesn’t shake or wobble during use. Owners state that assembly takes only about 30 minutes, and that the surface space is more than adequate for crafters and gamers alike. At such a low price, the quality cannot be beat. We’d recommend this desk for anyone who gravitates towards a more stark, modern style. Cozy apartments or small bedrooms need not go deskless with this adorable wall-mounted floating desk from Prepac. It comes in black, espresso or white, and can be mounted at any height with its built-in metal hanging rail system. We love the how this desk has a surprising amount of storage and shelving space while maintaining a small profile. At 42.2 inches long and only 19.8 inches deep when the desk is down, the Prepac desk all but disappears when it’s folded up. The installation brackets allow up to 100 pounds of weight on the desk—so go ahead and store that bulky almanac you rarely use, because this piece is sturdy enough for everything you need. Owners rave about the quality of the Prepac desk, and some even added a mirror to create a vanishing makeup vanity, which is a great idea even if you’re not short on space. We adore the Techni Mobili desk for its gorgeous mid-century design and its wallet-friendly price. Not only is this desk beautiful to look at, it’s incredibly well-made and extremely functional. It comes with a dual-compartment drawer and back storage compartment that opens to allow for easy organization of plugs and wires. It also comes with a five-year warranty, which covers manufacturers defects—some nice peace of mind to have when purchasing a lower-priced product. The Techni is about 45 inches long and has 21.7 inches of depth. Reviewers say the final piece is identical to the photo and looks stunning in a home office or tucked in the corner of a living space. If you’re looking for an affordable but beautiful desk, you can’t go wrong with this Techni Mobili. We don’t recommend you keep all of those old college papers or forgotten essays. But if you do, this Pinellas desk will help you keep all of your important (and hey, sentimental) documents sorted. The Pinellas desk comes with a built-in hutch (perfect for displaying books and other trinkets) and four pull-out drawers. Every inch of this large desk is meant to organize (or hide) all of those messy documents in your life to help you be more efficient. This desk is a big guy, coming in at 62 inches long and 57 inches tall, including the hutch. The Pinellas comes with a five-year warranty, and is made from manufactured wood. We love the light oak color because it keeps such a large piece from feeling overbearing in your space. Though installation may require two people, reviewers say the desk is a gorgeous and extremely sturdy addition to their home. If you’re hunting for a desk that will help you keep everything together, buy the Pinellas and watch your productivity flow. Nothing says “boss” like a corner desk, but just because you don’t have a corporate office doesn’t mean you can’t check that box. This Walker Edison desk puts a modern spin on the traditional corner desk, perfect for those who need the most possible surface space for computer monitors with the smallest possible footprint. Aside from a keyboard drawer, this desk doesn’t have storage space, but it still feels spacious and roomy. The Walker Edison is 51 inches long, comes in five color options and is made from tempered safety glass on a steel frame. The L-shape can also be disconnected to create two desks, which is great if you like to change up your space every so often. Owners love the Walker Edison for gaming as well as design work due to the massive space it has for screens and monitors. Sitting for extended periods of time can be harmful to your health, but this Safco Products Elevate standing desk allows you to keep your desk job and your health—and does so beautifully. This modernized desk adjusts in height so you can stand or sit, and has an adjustable footrest. Made from a steel frame with plastic leveling glides, the Safco is 48 inches long and adjusts to 50 inches high when expanded. Owners say it’s a great choice for laptop lovers and mobile workers, offering a chic workspace when you want to buckle down. The best part of this Safco standing desk is that the gliding system makes changing from sitting to standing a breeze. Whether you’re looking for a gorgeous, traditional piece that will last a lifetime or a modern and cleanly designed workspace, these desks will suit any need and any home.